Background: Uterine fibroid is the most common tumor of the female genital tract. The benign tumors often grow into large sizes and assume unsightly shapes with concomitant symptoms and signs. Being a predominantly reproductive age disease, concurrent infertility and symptomatic uterine fibroids pose management challenges. Individualization of the patient is thus essential to the success of the reproductive outcome. Objectives: This study determined the prevalence, trend, management modalities, pregnancy outcome, and exposition of factors affecting pregnancy outcome among patients presenting with uterine fibroids and infertility at the Obafemi Awolowo University Teaching Hospitals Complex (OAUTHC). Materials and Methods: This is a retrospective study of case records of 106 women managed for uterine fibroids and infertility over a 5-year period (January 1, 2012, to December 31, 2016) at the OAUTHC. The outcome measure is the pregnancy rate among those who had a myomectomy. Results: About a quarter of women with infertility had symptomatic uterine fibroids and this represents about 35%–40% of the overall number of women presenting as uterine fibroid within the study. About 84.9% had uterine size >12 weeks at presentation. Two-third of the patients had open myomectomy alone with 43.9% achieving conception thereafter. 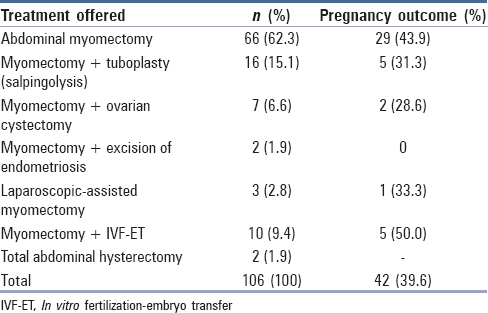 Conception rate for myomectomy with tuboplasty was 31.3% whereas myomectomy with subsequent in vitro fertilization (IVF) was 50%. Pregnancy rate decreased with increasing size of the uterus before myomectomy. Conclusion: Symptomatic fibroid was significantly prevalent among women with infertility. Myomectomy improves fertility potential and success rate of IVF. Uterine fibroid has both direct and indirect effect on infertility and pregnancy rate in this group of the patient can be improved through routine screening for uterine fibroids and early removal of the fibroids before they grow into giants size. Keywords: Infertility; myomectomy; pregnancy outcome; uterine fibroids. A significant number of patients with uterine fibroids have infertility component in their presentations.,,,, Symptomatic uterine fibroid with infertility poses management challenges, particularly in the young women of reproductive age group. Management strategies are usually individualized based on the associated symptoms other than the difficulty in getting pregnant, size and location of the fibroids, co-existing pelvic pathology, patient's age and the socio-economic status of many of these patients. 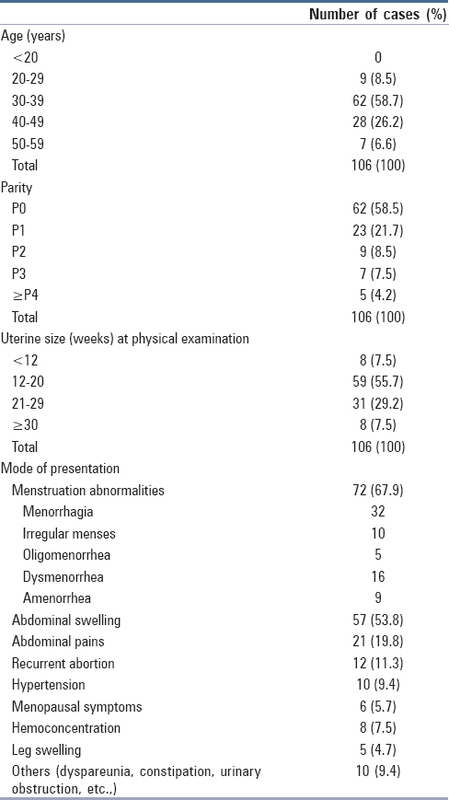 This study audits the contribution and pregnancy outcome of patients with uterine fibroids among the infertile women attending the gynecological clinic of the Obafemi Awolowo University Teaching Hospitals Complex (OAUTHC) with a view to determining prevalence, trend, management, pregnancy outcome, and exposition of factors limiting pregnancy outcome among patients presenting with uterine fibroids and infertility over a 5-year period. All cases of uterine fibroids with infertility diagnosed in OAUTHC Ile-Ife gynecological clinic medical record register from January 1, 2012, to December 31, 2016, were reviewed. The case notes of 106 of these patients were available for analysis from the computerized records of the medical records department. The case notes were studied, and data related to the patient's age, parity, occupation, clinical features, mode of treatment, and pregnancy outcome were collected and analyzed. The total number of patients presenting with fibroids and infertile women presenting yearly from 2012 to 2016 were also retrieved. All the 106 patients who constituted the focus of the study over the years reviewed were admitted after obtaining full history, physical examination, relevant investigations to identify the other factors of infertility before surgery. The data so obtained were stored, retrieved, and analyzed using Statistical Package for Social Science Version 20; (Chicago II, USA). There were 420 cases of infertility seen during the 5-year study while those who were diagnosed with fibroid with infertility were 106. This represents 25.2% of all cases of infertility [Table 1]. The medical record register revealed a total of 268 cases of uterine fibroids seen during the period, but those who presented themselves for further treatment were 193. 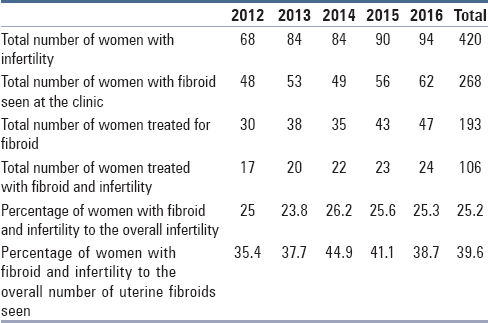 Of these 193 actively managed fibroid cases were 106 patients diagnosed with fibroid with infertility representing 54.9% of cases of uterine fibroids managed from 2012 to 2016. [Table 2] shows that uterine fibroids occur more in low-parity women and can attain very big sizes and apart from infertility, there are varied concomitant symptoms that may be associated with infertility. Forty-two pregnancies were recorded among the 106 patients giving an overall pregnancy rate of 39.6%. [Table 4] shows that the prognosis for pregnancy outcome decreases with increasing size of the uterus containing the fibroids. Better pregnancy rates are observed when the uterine size is <20 weeks pregnant uterus and this is statistically significant (P < 0.002). Majority of the patients were within the age range of 30–49 years. This is in agreement with similar studies in Nigeria.,,, Three out of every five of the women with fibroid and infertility were nulliparous. This finding is higher than that reported by Ekine et al., in their review of the clinical presentation of uterine fibroids and the effect of therapeutic intervention on fertility. The effect of prolonged estrogen exposure, as exemplified in nulliparous women, on uterine fibroid occurrence and growth is well established. Estrogen enhances tissue response to progesterone while progesterone causes immortalization of the smooth muscle cells resulting in the development and growth of fibroid. Notably, giant fibroids of ≥30 week size were found in 7.5% of the patients. Distorted and inaccurate health information among the populace may contribute to late presentation when complications have set in or the fibroids become huge. Menstrual abnormalities and abdominal swelling remained the leading presenting complaints as found in 67.9% and 58.3% of the patients. This is consistent with findings from several studies on the symptomatology of uterine fibroids.,,,, Menorrhagia may result from the increased endometrial surface area, vascular congestion causing increased uterine bleeding, prostaglandin imbalance in favor of vasodilators, and poor myometrial contractility. Menorrhagia leading to anemia, infection, weakness, and poor health together with abdominal pains and abdominal distention cause profound morbidity in fibroids which also worsens the outcome of infertility in those having the combined tragedy [Table 2], [Table 3], [Table 4]. Open myomectomy was offered to two-third of the patients, and of these patients, 43.9% had achieved conception as at the time of this report. This is comparable to 49% reported by Donnez and Jadoul  but lower than postsurgical pregnancy rate of 57% reported by Somigliana et al. Despite the attendant myometrial trauma and risk of adhesion formation following myomectomy, it is generally believed that fertility improves following the removal of uterine fibroids. Bulletti et al., conducted a study to evaluate the effect of myomectomy on fertility using three groups of patients numbering 106 in each group-a set of patients who had laparoscopic myomectomy, another set with fibroid that was not removed and the third group with unexplained infertility without coexisting fibroid. After 9 months of follow-up, pregnancy and favorable outcome were significantly recorded among the treatment group. In the absence of other causes of infertility, myomectomy is advised in patients with infertility and coexisting symptomatic myoma. The pregnancy rate of 31% following myomectomy and tuboplasty which is lower than the 50% recorded following in vitro fertilization (IVF) may further reinforce the relatively limited benefit of tubal surgeries in patients with infertility. However, tubal reconstruction surgeries may still have a place in our society where the financial implication of IVF may make it unaffordable for many couples. Improved outcome of IVF after myomectomy has been researched and established. The presence of uterine fibroid, especially, submucous fibroid prevents apposition of the developing embryo to the endometrium, hampers its adhesion and limits the invasion of trophoblasts in the tightly-regulated period regarded as the “window of implantation.” Thus without myomectomy, embryo transfer is unlikely to result in eventual pregnancy. The pregnancy rate decreased with increasing size of the uterine fibroid, such that the chance of conception for uterus that is not palpable par abdomen is three times that of the uterine size of 30 weeks or more. This highlights the importance of seeking care as soon as possible before huge fibroids develop. Fibroid, especially when huge, could contribute to subfertility by endometrial cavity distortion, elongation of distance to be traveled by the spermatozoa to reach the site of fertilization, suboptimal endometrial vascularization and incoordinate uterine muscle action culminating in poor gamete transfer. Cervical fibroid and degenerative changes may limit the frequency of coitus due to dyspareunia and mechanical blockage of tubal ostium at the cornu by fibroids in the body or fundus of the uterus may block gamete transfer. Uterine fibroid is thus a common finding among patients with infertility and quite a majority of them have poor pregnancy rate following myomectomy (60.4%). While it is preponderant in the active reproductive age, nulliparity remains an important risk factor. Late presentation with very huge uterine fibroids is still found in our environment. Surgical treatment offers improvement in reproductive outcome and enhances the success rate of IVF. Impalpable fibroids offer a better prognosis in reproductive outcome than those that are palpable par abdomen. It is therefore imperative to screen for uterine fibroids early and treat among the cohorts of infertile woman to improve fertility potential and pregnancy outcome. All women in the reproductive age group need a pelvic scan to detect submucous, cornual, and intraligamentous fibroid that can compromise the reproductive outcome in the Nigerian/African environment where the prevalence of uterine fibroid is highest. Machapali S, Morkus EP, Mukherjee TK, Reilly KD. Adominal myomectomy increases fertility outcome. Gynecol Obstet 2013;3:144. Verma M, Gupa R, Porwal KS, Gupta S, Swarnkar M. To study the prevalence of pelvic pathology among patients with uterine myoma. J Pharm Biomed Sci 2013;32:1279-81. Khaund A, Lumsden M. A benign disease of the uterus. In: Edmonds DK, editor. Dewhurst's Textbook of Obstetrics and Gynaecology for Postgraduates. 8th ed. Oxford: Blackwell Scientific Publication; 2012. p. 715-26. Adelusola KA, Ogunniyi SO. Hysterectomies in Nigerians: Histopathological analysis of cases seen in Ile-Ife. Niger Postgrad Med J 2001;8:37-40. Ogunniyi SO, Fasubaa OB. Uterine fibromyoma in Ilesa, Nigeria. Niger Med Pract 1990;19:93-5. Emembolu JO. Uterine fibromyomata: Presentation and management in Northern Nigeria. Int J Gynaecol Obstet 1987;25:413-6. Okezie O, Ezegwui HU. Management of uterine fibroids in Enugu, Nigeria. J Obstet Gynaecol 2006;26:363-5. Komolafe JO, Makinde ON, Ajadi AM, Dayo AA. Uterine leiomyoma in Ile-Ife, Nigeria. Trop J Obstet Gynaecol 2004;21:103-6. Ezem BU, Otubu JA. Hysterectomy in the Hausa/Fulani population in Nigeria. Int J Gynaecol Obstet 1981;19:145-8. Anate M. Uterine fibroids in Federal Medical Centre, Lokoja: A five year review 2002-2006. The Nigerian Clinical Review Journal 2007:5-12. Adinma JI. Uterine fibroid and fertility in Enugu. Niger Med J 1994;5:3-5. Egwuatu VE. Fertility and fetal salvage among women with uterine leiomyomas in a Nigerian teaching hospital. Int J Fertil 1989;34:341-6. Bajekal N, Li TC. Fibroids, infertility and pregnancy wastage. Hum Reprod Update 2000;6:614-20. Cook H, Ezzati M, Segars JH, McCarthy K. The impact of uterine leiomyomas on reproductive outcomes. Minerva Ginecol 2010;62:225-36. Zepiridis LI, Grimbizis GF, Tarlatzis BC. Infertility and uterine fibroids. Best Pract Res Clin Obstet Gynaecol 2016;34:66-73. Ezeama C, Ikechebelu J, Obiechina NJ, Ezeama N. Clinical presentation of uterine fibroids in Nnewi, Nigeria: A 5-year review. Ann Med Health Sci Res 2012;2:114-8. Okeke TC, Okezie OA, Obioha KC, Ikeako LC, Ezenyeaku CC. Trends of myomectomy at the university of Nigeria teaching hospital (UNTH) Enugu Nigeria. Niger J Med 2011;20:224-7. Aboyeji AP, Ijaiya MA. Uterine fibroids: A ten-year clinical review in Ilorin, Nigeria. Niger J Med 2002;11:16-9. Parker WH. Etiology, symptomatology, and diagnosis of uterine myomas. Fertil Steril 2007;87:725-36. Ekine AA, Lawani LO, Iyoke CA, Jeremiah I, Ibrahim IA. Review of the clinical presentation of uterine fibroid and the effect of therapeutic intervention on fertility. Am J Clin Med Res 2015;3:9-13. Adegbesan-Omilabu MA, Okunade KS, Gbadegesin A. Knowledge of, perception of, and attitude towards uterine fibroids among women with fibroids in Lagos, Nigeria. Scientifica (Cairo) 2014;2014:809536. Legendre G, Brun JL, Fernandez H. The place of myomectomy in woman of reproductive age. J Gynecol Obstet Biol Reprod (Paris) 2011;40:875-84. Somigliana E, Vercellini P, Daguati R, Pasin R, De Giorgi O, Crosignani PG, et al. Fibroids and female reproduction: A critical analysis of the evidence. Hum Reprod Update 2007;13:465-76. Bulletti C, De Ziegler D, Polli V, Flamigni C. The role of leiomyomas in infertility. J Am Assoc Gynecol Laparosc 1999;6:441-5.